We’ll wait for review units to determine if the reality lives up to the hype, but an early hands-on left us impressed. One of Europe’s leading home-security providers is coming across the pond in a big way. The 10-year-old French manufacturer Myfox today announced the availability of its Myfox Home Security System and Myfox Security Camera at Amazon, Home Depot, and other online and brick-and-mortar retailers. From what I saw during a hands-on demo last week, I’m comfortable saying Myfox’s offerings are innovative and very different from what’s on the market today. The $199 Myfox Security Camera features a motorized shutter that can be programmed to cover its lens when you arrive home, so you don’t need to worry that video footage of you dancing around the house naked is streaming to the cloud. 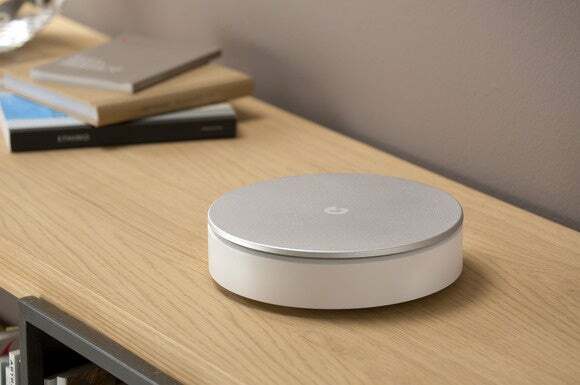 Myfox executive Scott Ledterman told me during the briefing that the company added this feature after its research revealed that 30 percent of home-security cameras owners unplug the devices while they’re home in an effort to ensure privacy. The camera determines whether you’re home or away via an app installed on your smartphone. If someone in the family doesn’t have a smartphone, they can carry a Bluetooth Low Energy keyfob ($30, not included) that can control the camera and perform other functions if you install additional Myfox components (more on that later). The camera has two-way audio, too, so it can function as a remote intercom. Also unlike most home security cameras, the Myfox is outfitted with a battery backup that can continue to operate the camera for up to one hour in the event of a power loss. That, and local storage sufficient for one hour of recorded video, ensure that the camera will still be able to capture the image of a burglar with the forethought to cut your home’s power before breaking in (the thief would have to walk into the camera’s field of view, of course). Apart from its unique industrial design, most of the Myfox camera’s feature set is par for the course for a modern home-security camera: 1080p resolution, motion sensor, infrared LEDs for night vision, and cloud backup. The camera will sit on any flat surface, or you can wall-mount it using a bracket ($30, also not included). For more than just a home-security camera, the $279 Myfox Home Alarm kit includes one of Myfox’s unique IntelliTag sensors, a 110dB siren, a Bluetooth LE keyfob, and a bridge that connects to your Wi-Fi router (the bridge establishes a wireless connection to your router, so it can be placed in a central location inside your home. Myfox plans to offer repeaters down the road, to increase the system’s overall range). The camera is not part of this kit, but up to four cameras can be added at any time. 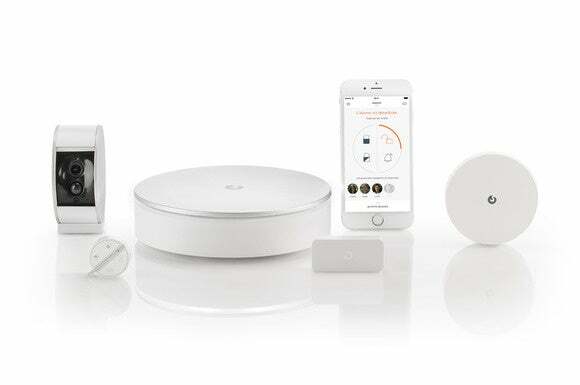 Myfox Home Alarm includes the siren, Wi-Fi bridge, one Bluetooth LE keyfob, one IntelliTag sensor, and the app to manage the system. The camera is sold separately. I describe Myfox’s door/window sensor as unique because it’s a one-piece unit. The more typical sensor harbors a battery, a steel plate, and a radio transmitter in one enclosure and a small magnet in the other. One half is mounted to the door or window and the other is attached nearby on the door or window frame. The only time the sensor sends a signal to the alarm system is when the door or window is opened, thereby breaking the magnetic field formed by the magnet and the plate. The one-piece IntelliTag houses not just a radio transmitter and a battery, but also a gyroscope, a vibration sensor, a motion sensor, a tilt sensor, and a CPU. Thanks to the presence of all that silicon, an IntelliTag can be installed on a garage door—not just a door or window—so that you can determine the door’s current state: open or closed (the Myfox system, however, isn’t capable of remotely opening or closing the door). 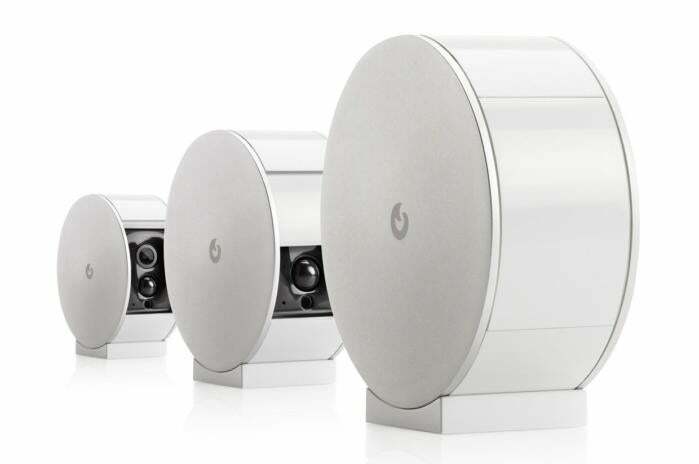 Myfox’s Ledterman told me that an algorithm running on that CPU can differentiate between a ball striking the door or window on which the sensor is mounted, a person knocking on the door or window, and someone hitting it with enough force to break it. Where most home-security systems register an alarm only after the thief has gained entry to the house, according to Ledterman, the Myfox system is designed to trigger an alarm before that happens. The alarm component can fire off a 110dB siren to alert the homeowner to a break-in and hopefully scare off an intruder. IntelliTags utilize radio frequencies in the 915MHz spectrum, so they’re capable of traveling long distances (up to 100 meters through walls, Ledterman said). Ledterman also told me that Myfox has developed anti-jamming technology that will send a text alert to your smartphone if a sophisticated attacker tries to electronically block transmissions between the sensors and the bridge. The kit comes with just one sensor, but the system can support as many as 50 (although most people won’t go that far because the sensors cost $50 each). Because the Myfox Home Alarm kit doesn’t come with a central control panel, it relies on the presence of Myfox keyfobs for arming and disarming. You can also use your smartphone for these tasks, but the keyfob offers the advantage of doing it automatically. Each one can be programmed with a different level of security. You might want the one your pre-teen latchkey kid carries to disarm itself when he or she arrives home, but to leave the security camera’s shutter open so you can check on them. But when your privacy-conscious teenager come home, you might prefer to close the camera shutter so they don’t just unplug the camera. Ledterman maintains using the keyfobs for proximity detection is superior to using geofencing on a smartphone. Relying on GPS drains the phone’s battery faster, and if the phone is dead when you get home, it won’t disarm the system anyway. The keyfobs can also send the homeowner alerts when people come and go, and Myfox has joined the Works With Nest program so that its devices can be integrated with a Nest thermostat and other products in that initiative. Well, this ended up being a very long story. If I haven’t answered every question you might have about the Myfox Security Camera and Home Alarm Kit, drop me a line or post your question in the comments below and I’ll try to answer it when I get my hands on a review unit.